The Cosmopolitan Magazine May, 2011 issue have hit stands across the country! 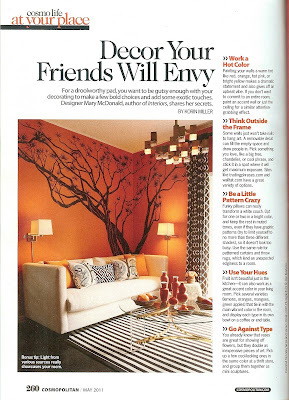 We were surprised to see that WALLTAT Japanese Maple Tree Wall Decals was featured in the "Decor Your Friend Will Envy" story (page 260). Interior Designer Mary McDonald was interviewed by the magazine to share her secrets in achieving a "droolworthy pad" and we were proud to have made the cut! Just as we encourage customers to use "Art Without Boundaries," McDonald also recommends thinking outside the frame when redecorating your digs. 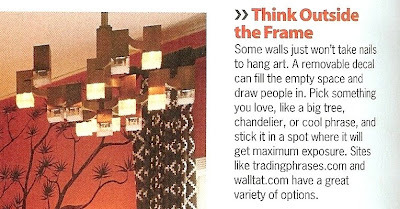 She also suggests installing your favorite design in an area with maximum exposure to draw your guests into the space. We couldn't agree more.